One of the rarest birds in North America, the female may have up to four mates at one time. 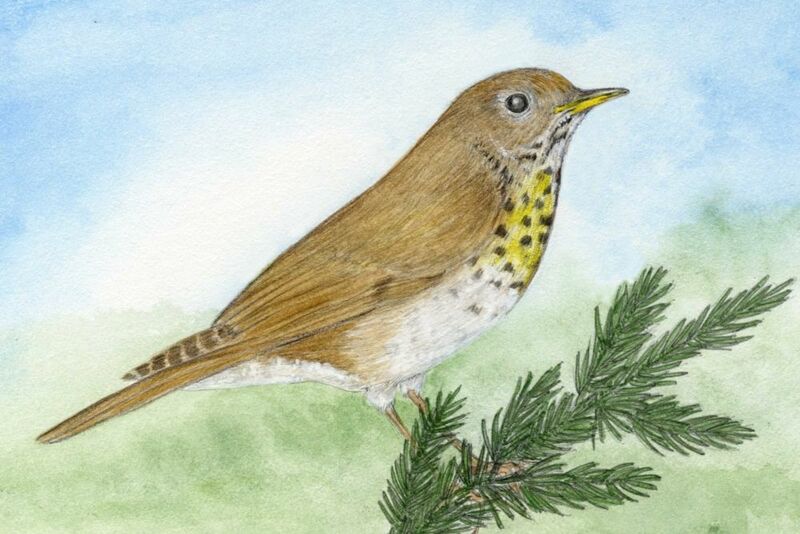 The breeding habitat of Bicknell's Thrush is primarily restricted to mountain spruce forests of Northeastern US and Canada. They winter in the Caribbean and spring migration north is cued by day length. If spring arrives early in the north and the Thrushes arrive at their normal time, the abundance of food—insects and fruit—would already have peaked. Warming temperatures also produce an abundance of spruce and fir cones—feeding and increasing the population of Red Squirrels, a main predator of eggs and chicks. Storms and hurricanes threaten the Thrush's tropical winter habitat. Pollution, logging and deforestation threaten their spring breeding and winter habitats. Before 1800 there were an estimated 10–20,000 Whooping Cranes in North America. By 1941, because of hunting and habitat destruction, there were fewer than 20. There are now approximately 350–380 in the wild. 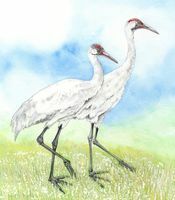 The wild Whooping Crane population has only one winter habitat—a wildlife refuge on the Gulf Coast in Texas; and one spring breeding habitat—a prairie wetlands in Alberta. Severe storms, sea level rise, drought, industrial development and oil spills threaten these habitats. Another significant threat to young Whooping Cranes is colliding with power lines in their migration corridor. Tufted Puffins are threatened by sea level rise and storm surges which destroy habitats and breeding areas. In some areas of North America warming seas are causing the fish that the Puffins feed on to migrate farther north, making it difficult for them to find adequate food. Other threats are entrapment in fishing nets, oil spills, pollution, ingestion of plastic, human disturbance of breeding colonies and introduced predators such as rats and foxes. 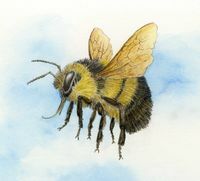 The Rusty Patched is the first bee to be listed as endangered in the US. Populations have declined as much as 87% from habitat loss, disease and pesticides. Climate threats include: warming and precipitation, early snow, late frost and drought. Bees and butterflies are important agricultural pollinators. In 2016, 40% of invertebrate pollinators (bees and butterflies) were listed as threatened with extinction. For decades wild salmon populations have been in decline from human causes: over fishing; habitat degradation—logging, mining, agriculture and dams; pollution; and interaction with hatchery or farmed salmon. These conditions and threats may hinder their ability to adapt to the effects of climate change. Salmon thrive at specific freshwater temperatures—warming air raises water temperature. Early snow melt and increased rains cause physical changes to spawning streams. For the Bicknells Thrush climate conditions such as temperature or rain are triggers for migration, breeding, hibernation, egg laying or other actions. For example, earlier spring temperatures may cue a species to start migration northward, but arrive at their seasonal nesting habitat before food is available or abundant. Sea level rise is caused mainly by glacier and ice melt and expansion as sea water warms. Higher sea levels destroy human and natural habitats by erosion, salination of freshwater and soil, and increased storm surges (flooding during typhoons or hurricanes.) Sea level has risen about eight inches in the last century, but the rate of increase has nearly doubled in the last two decades. Destruction or fragmentation from deforestation, mining, agriculture, dams and roads, filling wetlands, dredging or diverting rivers. * 75% of marine debris is plastic—contaminating shoreline and deep sea habitats from the poles to the equator. 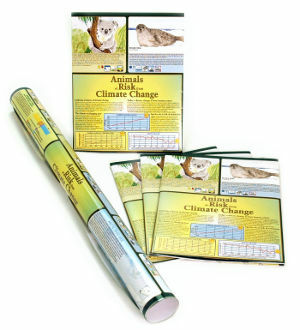 Get the educational wall poster with indepth information about about how climate change impacts animals.